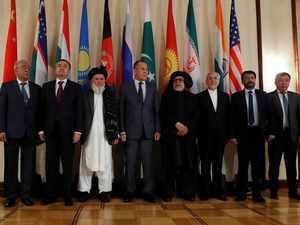 Attended by representatives of over fifty countries and international organizations, the International Contact Group (ICG) held meeting in London during which its members stressed on continuation of their support from Afghan peace process and fighting terrorism. Representing Afghanistan, deputy political minister of foreign affairs Edriss Zaman briefed the participants about Afghan-led peace process, holding 3rd meeting of Kabul process and the upcoming presidential elections. Achievements made over the last seventeen years should be protected in peace negotiations, he said during the meeting. UN secretary general’s special envoy Tadamichi Yamamoto was also attended the meeting. UNAMA twitted that forty countries have declared to continue cooperation with Afghanistan. The meeting held while Afghanistan is facing with two important issues, one is peace talks and the other is holding presidential elections. This is while that US President Donald Trump said if peace negotiations led to restoration of peace in Afghanistan, he will withdraw all US forces from Afghanistan. Officials of High Peace Council (HPC) are stressing that the regional countries should play their role in supporting Afghan-led and owned peace process, because, Afghan people want a lasting peace to be prevailed throughout the country. But, the lower house of the parliament believes that gaps on peace process have caused to raise concerns among the people. As peace efforts are still ongoing, pointing at peace talks with Taliban representatives, US special envoy Zalmai Khalilzad said we have had visible improvements on two vital issues, one is fighting terrorism and another one is withdrawal of US forces from Afghanistan, but it doesn’t mean that we are done and the mentioned issues got finalized. Meetings being held on Afghanistan issues particularly peace process, should be done in coordination with the government and people of Afghanistan, experts and criticizers said. Experts believe that the peace key is at the hands of own Afghans and they need intra-Afghani negotiations to break the war deadlock, thus, no foreign efforts would follow with fruitful results unless own Afghans decide in the respect. Calling coordination among the regional and world countries key to restore peace and fight terrorism, exerts hope the ICG meeting could result in practical strategies to reach lasting peace in Afghanistan. They added such meetings wouldn’t be followed with any positive result unless a consensus among the regional countries is existed. The International Contact Group has been established in 2019 to discuss Afghanistan related issues and including UN and EU, a number of other countries and international organizations have its membership.